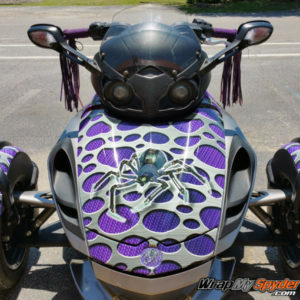 Flame up your Spyder with our 21 flame in Pink / Purple fading colors. With our easy apply film this kit installs with ease, just peel and stick to have this custom flame effect. This kit is very versatile and allows you to separate each flame piece and place them wherever you like on the machine. See the photos attached to get an idea of how you can apply this kit. This kit provides a generous amount of flames in a variety of sizes to give you the look you want. More pieces can be requested if needed. See video below for application tips. For that extra pizzazz add the Glitter Sparkle laminate. This is a glossy laminate with a sparkle effect. You will be the envy of all.